We are fortunate enough that most of the time we have a babysitter for our children, we are able to use my parents, who watch our children for free. 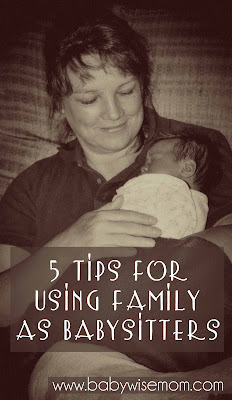 Here are my tips for using family as babysitters. These tips are in the context of you are having a family member watch your child for free and it is on occasion. These are not the same tips I would have if you were going back to work and your family member was watching your child consistently. This is you going out on a date or going to help in the school or going away for a little vacation. You can see more tips on my Babysitters Post. You can also get reader advice in this post on Daycare/Childcare and Babywise. Write or type out the schedule for your family member. Go basics here. What time is each meal? What time is each nap? What time is bedtime? Include details as needed. How many ounces should they expect the child to drink at each meal? What are some food ideas for each meal? Any special nap instructions? Any medications needed? Where are the diapers kept? Does your child need to be reminded to go potty? The first time my family watched Brayden for an extended time, I wrote out his schedule. He was 7 months old. They were super impressed that I knew what time he would be up and what time he would want to go down for a nap. As technology has improved, I have started texting the information to my parents. If I am going to be gone a short time, I just text what time Brinley will go down and anything my mom should/could expect. Then they can easily reference the text at any time to see what the schedule is. Set out PJs before you leave. For the baby, I set out the PJs, diaper, diaper cream, etc. on the changing table. Prepare food to eat. My mom recently watched Brinley for the day while we all went to a local amusement park. I packed all of her food into a pic-nic basket so it was all in one easy spot for her. Then she could easily access what Brinley can eat and what she likes to eat without hunting through the kitchen. Allow for flexibility–more on that in the info that follows below. Write down information for them to refer to. See that section above for full details. And a tip, make it clear you did these things to make it easier for them, not because you think they are incompetent. Take a moment to write out your child’s schedule for the person watching your child. I just write the basics–what times do your child eat and sleep. I don’t include structured play, free play, independent play, learning activities, etc. The family member is watching the child for free and this is a once-in-a-while thing, so I just focus on the basics. I will, however, write down when independent play usually happens. I explain what it is and tell the person if they want to, they are welcome to do independent play but it is okay if they don’t. I also include a meal plan written down for younger children. I write what they usually eat (and as I mentioned above, I will pack it up to make it easy). Allow some flexibility here. When our parents watch our kids, we let them stay up a bit later than usual. We give fair warnings–like McKenna becomes a lot harder to handle after the clock strikes 8:15 (true story), but if you want to let her stay up until 9:00, go ahead. We do keep our babies on the same routine, and the grandparents wouldn’t want to mess with it anyway because the babies get a bit grumpy when they are late for their sleep. With Brinley, I will say, “Her nap starts at 2:30, but if she is being happy you can keep her up until 3:00.” Then they can get some extra time in with her but she still has a good nap time set for her. Pick your battles. Remember they are working for free.Only ask for the things that are of most importance to you. Keep the adage “beggars can’t be choosers” in mind here. They are doing this for free and you can’t be picky about it. As age appropriate, talk with your children before the babysitting time starts. what is allowed and what is not allowed. Remind them of rules that you want enforced that you know your family member won’t enforce. I have a friend whose parents will show her children media she isn’t comfortable with, so she has a rule that they have to call her and ask permission to watch any show they are thinking about. If they don’t follow that rule, she won’t let them go to grandma’s the next time. They are sure to call. Once you have explained ground rules, ask your child questions to be sure he understands the rules. For more on this concept, see my post Ask and Tell. Don’t take advantage of the generosity of your family members. Ask them what time they want you back by. Don’t abuse the help. Exactly how this plays out will vary from person to person. For example, my dad is super relaxed and really doesn’t mind sitting on our couch late at night, so we can stay out past midnight when he is watching our kids. If it is just my mom, she prefers us back around 10. When both of my parents come, they will drive separately and my mom will leave after Brinley and McKenna are in bed and my dad will stay and party with Kaitlyn and Brayden. What tips do you have for using family as babysitters? oh Val, that tip about getting your kids to call and ask before watching a movie is GOLD!!! I have been feeling concerned lately about the shows my kids have been watching at their grandmothers and also at friends houses. This seems like a simple way to get some of the control back and not put too much burden on the kids to have to decide. thanks! !